As one of the attractive tourist destinations and the oldest in the world, Egypt with the retention of many collections famous antiques and national treasures and the legends that many tourists admiring awe in centuries. Egypt with an impressive culture that does not mixed with any other place will definitely be a big challenge for those who want to discover all the beauty of it. Here are the top 10 sites was particularly impressed to visit when traveling to Egypt. 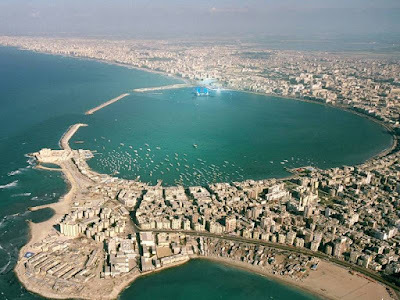 Alexandria is long time ago known for the second largest city of Egypt, Alexandria gives us many feeling, one of the feeling is being in world-class city like Marseille or Athens or the mediterranean . Known by the tall buildings and the luxury shopping mall, in the past Alexandria was already a very trendy city. Although currently some charm has faded a little bit follow the timeline, but there are still many attractions points to visit. You can visit the Palace Gardens Montazah palace with large and quiet garden, you can come here to learn about the history and architecture of Qaitbay, an impressive fortress which was built in the 15th century; or you can also have the chance to choose one of the old café. Sip a cup of coffee in your hand while looking at the Mediterranean sea is also a good idea. When you can overcome the chaos, the culture shock as well as "ticket brokers" in Cairo, the city is really a dream destination by many tourists. For history researcher, this is the place for them, by the cultural tradition seems to be kept perfectly the same as before in every corner of the city. There are many ancient temples, tombs, churches, monuments and museums to explore. And do not forget to visit the famous antique market Khan el-Khalili bazaar street, especially when you're searching for a few things like flying carpets or brass jewelry. However, the real beauty here is the Red shore with clear blue sea water and the diversity in the number of fish and corals. And that is why this place is considered one of the most amazing dive sites, giving you the best experience of scuba diving. Among the Seven Wonders of the Ancient World, only the Pyramids of Giza could survived throughout the time. There is not a single visitor leaving Egypt without visiting the Pyramids as well as the Sphinx at Giza. It's the only place left in the seven wonders of the ancient world and stay there for over 4,600 years. This really is a magnificent spectacle, and also hides a lot of mystery. Just visit the main part of the pyramid take you about 2 hours, but to explore the many attractions further you need to spend about a day! Only a few places in the world can be called an outdoor museum and the city of Luxor Egypt is one of them. In fact, the number of protected areas and monuments in Luxor is the largest region than anywhere else in the world and most of the holidays in Egypt will have no meaning if you do not visit Luxor. If given the opportunity to travel to Egypt, take one to two days to visit the valley of the kings and queens for more than 60 graves underground. Make sure you will have a visit to Luxor and Karnak temples impressive here. 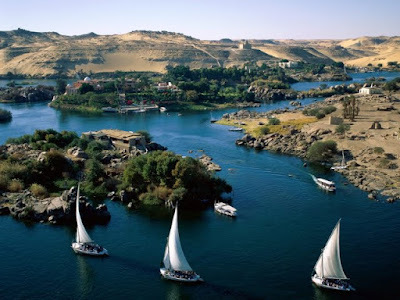 The best way to discover one of the most famous rivers in the world is to spend few days at the great Nile. Nile with rich flora and fauna will give you a complete view about rural areas of Egypt. In addition, you can stop to visit a lot of temples and ancient monuments. If you do not want to travel by boat, standing on the Aswan dam to see the sunset is also a good choice. If you are in the Cairo area, you should try a trip of about 1 to 2 days to Mount Sinai. This is a point to the huge religious significance has been mentioned many times in the book of Exodus, the Bible and the Quran. Hiking up the mountain church is a popular activity here, many people even choose to go overnight or in a hostel can get up at 2 or 3 am to watch the sunrise mentioned in the Bible. Saint Catherine's Monastery can be found at the foot of Mount Sinai. It is one of the world heritage by UNESCO and is the oldest monastery in the world. Monastery of Saint Catherine is said to be built on the location where the prophet Moses saw the gods through a burning bush. Saint Catherine's Monastery was built to house female martyrs memorial Catherine. Situated in the middle of the hill trails and desert quicksand Qattara Egypt, Siwa culture has distinct characteristics different from the mainstream of Arab culture. These people said Siwan language and this place is known for its hot springs, beautiful jewelry and olive oil. White desert in Egypt's legend can be found 28 miles north of the town of Farafra. Desert has in it an amazing beauty in the world with the magical white rock formed from the desert sand. The outstanding structure of the giant stones were created as a result of frequent sand storms occurred in the region. Drive car crossing the desert or stay overnight here is a real experience of "bravery".